Last week I saw the Point Pleasant (2005) boxset for sale in a charity shop, and figured it might help to get me into the Halloween spirit… unfortunately, it inspired more yawns and derisive chuckles than thrills and chills, so I wasn’t too surprised to learn that the series was cancelled after only eight of the thirteen episodes had aired, due to poor ratings. If you’ve never seen the show, it’s basically The Omen reimagined as a glossy teen soap opera, with the spawn-of-Satan recast as a blonde hottie named ‘Christina’, who washes up in an affluent seaside resort on the New Jersey coast, and promptly sets about trying to make friends with the unsuspecting locals, while attempting to duck the devilish Suit who’s been sent to coax and cajole her along the path to darkness. Despite its prominence in the title (and supposed importance in doom-laden prophecies), I actually got very little sense of “Point Pleasant” as a place. There were always plenty extras filling out the party scenes, but it still seemed like the main characters were the only people living there… like the only moving parts in a poorly animated cartoon. The town had no more depth to it than a painted backdrop, so all the talk of it being laid to waste became eminently shrug-worthy… as were the supposedly nightmarish visions of the not-at-all-devastated streets littered with prone bodies, that just made it look like Christina had wandered into a massive game of “Ring Around the Roses”. Meh. I couldn’t help pining for the awesomely apocalyptic image of a smirking Lex Luthor stood in a field of ash and bones, as blood rained down from the sky, shown in the first season of Smallville… and when a show about The AntiChrist is cleaner-cut than one about Superman, you know you’re in trouble! The best thing the show had going for it was lead actress Elisabeth Harnois, who is so beautiful and charismatic, it’s pretty easy to imagine the world happily following her into Hell. She’s also a very talented actress, and was able to modulate Christina’s mood-swings from vulnerable “lost girl” to rage-fuelled-demon perfectly… and her bat-crap-crazy turn in the finale actually made me a little sad that there wasn’t going to be a second season, so we could see her get a better handle on her powers and have a little fun with them… assuming the writers didn’t muck it up by miring her in the Point, and resurrecting her tedious love interest ‘Jesse’ (Samuel Page) again! Having her fall in love with a heroic human seemed like a pretty good way to explore Christina’s “good” side… but having that handsome hunk also turn out to be a immaculately-conceived, semi-immortal nemesis created to destroy her, was just laughable. I mean, I like the idea of having her boyfriend face a choice between killing her for the sake of humanity or trying to sweet-talk her back to the light side… but his “character” was such a cardboard cut-out, and his actions and motivations were too muddled in the end, so his ethical dilemma never had me even close to the edge of my seat. Since the show’s co-creator Marti Noxon worked on Buffy for several years, I couldn’t help seeing this as a pale imitation of the showdown between Buffy and Angelus at the end of Season Two… without any of the emotional stakes, or investment. As for the rest of the cast… Aubrey Dollar played ‘Judy Kramer’, daughter of the town’s sceptical doctor, who became Christina’s first friend and adoptive “sister” after her rescue. Susan Walters played ‘Meg Kramer’, mother of Judy and her deceased sister ‘Isabelle’ (Audrey Marie Anderson) who had taken to sending the family cryptic warnings from beyond the grave via an indestructible VHS tape that seemed way more interesting before we actually saw what was on it! * Dina Meyer played ‘Amber Hargrove’, a slightly boozy seductress, who had her blurry sights set on Meg’s husband… until she discovered the anti-climactic video tape and suddenly developed a conscience. Meh. Cameron Richardson played her daughter ‘Paula’, who… er… was pretty forgettable, aside from being the long-time girlfriend that Jesse dumped in favour of Christina. Clare Carey played ‘Sarah Parker’, Jesse’s goodly, God-fearin’ mother, who ended up cheerfully volunteering to sacrifice herself as part of a ritual to banish Christina’s spirit, in the unlikely event that her son managed to fatally wound the girl. Getting back to our anti-heroine, I was very disappointed by the way she was “marked” as a child of the Devil… in The Omen, Damien had a “666” birthmark on his scalp, hidden by his hair, but Christina had a really fakey looking sigil imprinted on her iris, slightly off-centre and slapdash, with no apparent thought given to its placement. For some reason that really, really bugged me. It would have looked a lot cooler if the sigil had been larger, and covered her entire iris… especially if it lit up when she got angry, as this teeny little thing did a couple times. 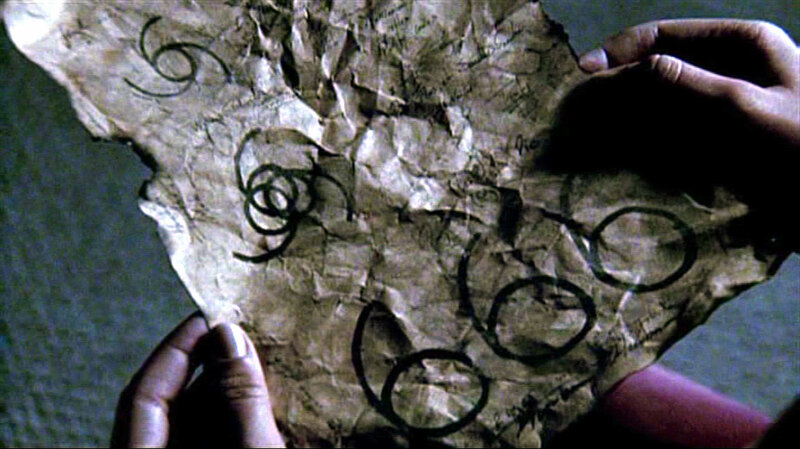 Hilariously, in the second episode Christina salvaged a single singed page of prophecy from the wreck of a burning yacht (don’t ask), only to find that it featured a sketch of the same symbol, followed by another version of it decoupling into three individual sixes, followed by the number “666” written in a huge font and taking up the entire width of the paper, as if the show-makers weren’t quite sure their viewers would be able to decipher the sigil by themselves, and needed it spelled-out for them in the most obvious way possible! And it was played like this big, dramatic, episode-ending revelation, even though it was roughly equivalent to screaming “OHMYGOD! THIS CHEESE IS MADE OUT OF COW’S MILK!! !” Gah! * Because when Amber first discovered the tape, she watched it with the sound off, and the screen facing away from us, with a look of horror on her face, as if she was seeing something really stomach-churning (presumably involving the father/doctor)… but that was just a cheat and a cheap fake-out. In fact, the tape was a short suicide note from Isabelle, in which she claimed she could see bad times ahead, but didn’t bother going into any details to help her family prepare for the coming apocalypse! This entry was posted in Rants about TV and tagged Aubrey Dollar, Audrey Marie Anderson, Cameron Richardson, Clare Carey, Dina Meyer, Elisabeth Harnois, Marti Noxon, Point Pleasant, Susan Walters. Bookmark the permalink.